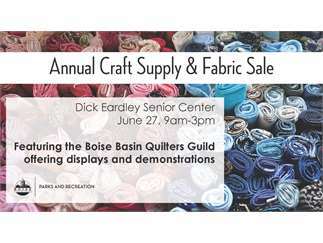 We have combined two popular events—the Craft Supply Sale and the Fabric Sale and Quilt Display—this year into one big, exciting event. Mark your calendars for Wednesday, June 27 from 9 a.m. to 3 p.m. and plan to stop by for some great deals! As an extra bonus, we’re teaming up with the Boise Basin Quilters Guild to offer quilt displays and quilting demonstrations from 9 a.m.-1 p.m. Start your holiday crafting early with this great event! For more information, give us a call at 208-608-7580.